Two Formlabs conferences are returning to Boston on May 7 and 8, 2019! 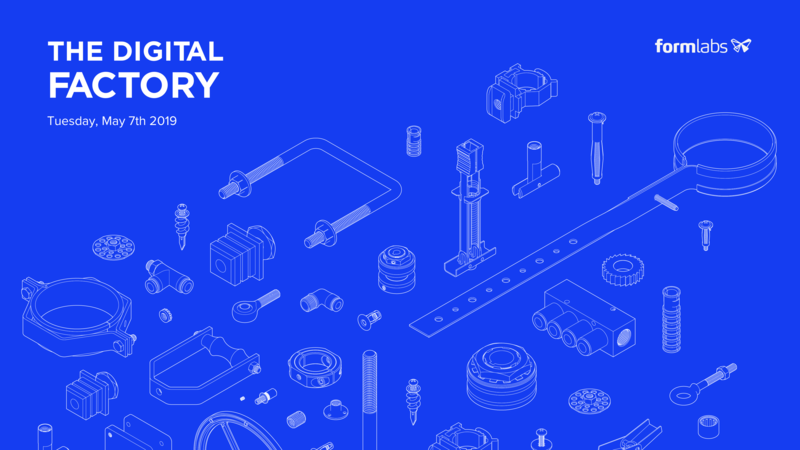 You’re invited to The Digital Factory and Formlabs User Summit, featuring leaders across digital manufacturing and Formlabs users building the future of 3D printing. Read on to learn more about each event and reserve your early-bird tickets. Don’t miss our discounted bundle tickets and act early! These events have sold out every time. Now in its third year, this May's Digital Factory conference will be the largest ever. Hosted by Jeff Immelt, the day-long event celebrates manufacturing as the next secret weapon for executives across industries, from aerospace to consumer goods. The Digital Factory will bring together CEOs, technical managers, and supply chain executives who believe digital tools can unlock entirely new business models, with the power to enable mass customization, digital supply chains, and rapid product development. The last Digital Factory events brought together leaders that covered topics across digital manufacturing, including a presentation on mass customization from New Balance Vice President of Manufacturing Innovation Edith Harmon (left) and MIT’s Daron Acemolu, who discussed robots and the future of work (right). You’ll hear from Immelt and many more who are already seeing returns on their digital manufacturing investments, and leave with insights into the market forces, new technologies, and management approaches shaping today’s top companies. Discover new business models and technical strategies, and learn about the latest advances in areas like additive manufacturing, automation, artificial intelligence, connected machinery, and intelligent supply chains. Formlabs users are leaders in 3D printing, exploring new processes and applications and shaping what’s possible with our products and beyond. The Formlabs User Summit gathers our super users, plus the people across industries helping build and scale the future of digital fabrication. Whether you’re just getting started or leading the way, the summit is your chance to connect with and learn from these communities and get behind-the-scenes access to the Formlabs people behind the printers. Attend to immerse yourself in success stories and interdisciplinary discussions, and learn actionable tips and techniques for perfecting and scaling your own 3D printing designs, workflows, and parts through hands-on workshops. Our first user conference offered unprecedented access to Formlabs users, people, and products. Experts, influencers, and curious minds across industries came together to talk shop, share tips and techniques, and inspire each other to continue to grow their work and build the future of 3D printing and beyond. For sponsorship interest, event suggestions, or general questions, please contact [email protected].